You don’t have to read this. You’re an adult, and adults don’t need to be told these things. But adults have friends, and sometimes our friends forget that they’re supposed to know better. So maybe read this for them, and next time one of them even thinks about drinking and driving, remind them of all the reasons there’s absolutely no reason for them to do it. Obviously you know this. But did you know it's actually a pretty good job? There are an infinite number of rideshare services out there. Even in Austin, where battles with the city have caused the two major services to leave town, there are at least 13 sharing-economy alternatives to getting behind the wheel yourself. Depending on where you live, you might not even have to pay for the ride. Case in point: last year the New Jersey Licensed Beverage Association struck a deal with a rideshare heavyweight to provide free rides home up to $20 from its member bars. Other private entities strike similar deals. For instance, one personal injury law firm down in Texas offers $10 rideshare coupons to anyone who feels like driving home themselves might put them in need of the firm’s services. Obviously saving $10 should not be a precondition to refraining from any act that poses a danger to yourself and others. The larger point is, there are people out there willing to make small sacrifices so that you don’t make a larger one. Worried about leaving your car behind because it might get stolen? The most sensible counterargument here is, if you try to drive it home, it might not be worth stealing much longer. But there are also plenty of services -- from nationwide enterprises to Designated Drivers of Buffalo -- that will drive your car home for you. None of the above even factors in good old-fashioned taxis, alternative, thigh-powered transport like pedicabs, or public transportation -- which could be made even more attractive by programs like the one Brazil instituted during Carnival last year, where free subway rides were given away in exchange for empty beer cans. If worst comes to worst, remember it’s the holidays: your parents will be overjoyed at the opportunity for nostalgic bonding presented by having to come and pick you up at 2am. Roughly every decade, the National Highway Traffic Safety Administration conducts a national roadside survey intended to measure impaired driving rates. The last one, in 2013-14, leveraged data from 300 locations across the US. It found a 30% drop in measurable alcohol levels since the last survey, in 2007 -- and an 80% drop since the first survey, in 1973. Those results are due to a number of factors. Reduced speed limits, stiffer legal penalties, and awareness campaigns all contributed to the first few decades’ decline. As for the last 10 years, a study concluded by Temple University in 2015 found that the introduction of rideshare services into a market “significantly” reduced the number of drunk driving homicides. Whatever the reasons, with each passing year, it’s more and more accurate to say that everybody doesn’t do it. Accidents are a 100% preventable tragedy; it only makes sense to reduce drunk driving rates to 0%. 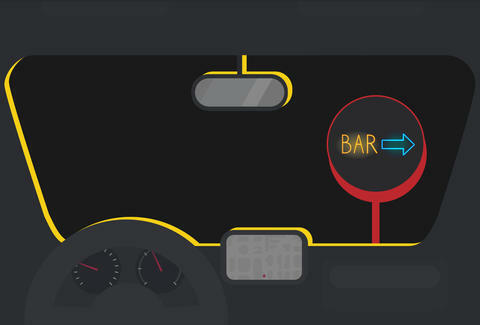 Last year the NHTSA unveiled something called the Driver Alcohol Detection System for Safety (unwieldy but the acronym is a winner). According to Engadget, the agency won’t make the system -- which includes advanced breathalyzers and touch sensors -- mandatory, but the same article also referenced auto manufacturer-led innovation including “sweat detectors” and pupil monitors that have been underway since 2007. There’s also the potential for private venues to get in on the prevention game. In 2013, the Belgian “mega-club” Carré equipped a parking lot barrier with a breathalyzer; fail the test, and you couldn’t leave, at least not with your car. Between the government, manufacturers, and drinking establishments mega enough to have parking lots, at some point technology is going to start making choices for you. Don’t wait: exercising free will is much more satisfying than bending to the will of the machines. Do NOT drive drunk. I will find you. I will arrest you. I will make you listen to One Direction cover bands on the way to jail. Seriously, those guys mean so well, as do the police on Prince Edward Island in Canada, who've threatened to force offenders to listen to Nickelback's third album on the way to jail. Listen to "How You Remind Me" ten times in a row, and you'll never have to be reminded not to drink and drive again. Why did we write this story? The answer is simple: we don’t want you to drive drunk. But the best way to convince people not to do something is to show them the consequence: by having them experience an alcohol-related crash head-on. Trust us when we say that you may not want to watch the below eye opening, 360° video presented by Johnnie Walker -- but you should watch it anyway, and tell your friends to do the same. If it helps just one person have many more holiday seasons, then it’s worth it.